Background and objectives C3 glomerulopathy is a form of complement-mediated GN. Immunosuppressive therapy may be beneficial in the treatment of C3 glomerulopathy. Mycophenolate mofetil is an attractive treatment option given its role in the treatment of other complement-mediated diseases and the results of the Spanish Group for the Study of Glomerular Diseases C3 Study. Here, we study the outcomes of patients with C3 glomerulopathy treated with steroids and mycophenolate mofetil. Design, setting, participants, & measurements We conducted a retrospective chart review of patients in the C3 glomerulopathy registry at Columbia University and identified patients treated with mycophenolate mofetil for at least 3 months and follow-up for at least 1 year. We studied clinical, histologic, and genetic data for the whole group and compared data for those who achieved complete or partial remission (responders) with those who did not achieve remission (nonresponders). We compared remission with mycophenolate mofetil with remission with other immunosuppressive regimens. Results We identified 30 patients who met inclusion criteria. Median age was 25 years old (interquartile range, 18–36), median creatinine was 1.07 mg/dl (interquartile range, 0.79–1.69), and median proteinuria was 3200 mg/g creatinine (interquartile range, 1720–6759). The median follow-up time was 32 months (interquartile range, 21–68). Twenty (67%) patients were classified as responders. There were no significant differences in baseline characteristics between responders and nonresponders, although initial proteinuria was lower (median 2468 mg/g creatinine) in responders compared with nonresponders (median 5000 mg/g creatinine) and soluble membrane attack complex levels were higher in responders compared with nonresponders. For those tapered off mycophenolate mofetil, relapse rate was 50%. Genome-wide analysis on complement genes was done, and in 12 patients, we found 18 variants predicted to be damaging. None of these variants were previously reported to be pathogenic. Mycophenolate mofetil with steroids outperformed other immunosuppressive regimens. Conclusions Among patients who tolerated mycophenolate mofetil, combination therapy with steroids induced remission in 67% of this cohort. Heavier proteinuria at the start of therapy and lower soluble membrane attack complex levels were associated with treatment resistance. C3 glomerulopathy, a form of complement-mediated GN caused by dysregulation of the alternative complement pathway, is a heterogeneous disease with respect to etiology, clinical presentation, and prognosis. Several genetic mutations and autoantibodies have been implicated in the development of C3 glomerulopathy (1–12). The clinical presentation of C3 glomerulopathy varies from asymptomatic hematuria and proteinuria to the full nephrotic syndrome, and it is usually accompanied by low serum C3 levels (6,13). The most common histologic finding is membranoproliferative GN with C3-dominant staining (14,15). The presence of highly osmiophilic electron dense deposits in the intramembranous region is the hallmark of dense deposit disease; if such deposits are absent and the deposits are in other glomerular locations, the term C3 GN is applied (16). Progression to ESKD has been reported in up to 50% of patients with C3 glomerulopathy (13), and recurrence after transplant is common (17). Given the high risk of progressive kidney disease and allograft recurrence, a number of attempts have been made to alter the course of C3 glomerulopathy (6,13). These efforts have included antiproteinuric medication (e.g., renin-angiotensin-aldosterone system blockade) and immunomodulatory therapy with corticosteroids, mycophenolate mofetil (MMF) (18), rituximab (19), calcineurin inhibitors, and complement blockade (20–23) to varying degrees of success. The Spanish Group for the Study of Glomerular Diseases (GLOSEN) published a report of 22 patients with C3 GN treated with MMF and suggested that those treated with MMF had better kidney outcomes than those treated with supportive care alone or other immunosuppressive regimens (18). Here, we review our experience with a standardized MMF-based regimen for the treatment of C3 glomerulopathy in 30 patients treated at our center in New York City and a companion center in Istanbul. These data present the largest experience to date using MMF-based therapy for C3 glomerulopathy. We analyzed the clinical and histologic predictors of response to MMF in the treatment of C3 glomerulopathy. We compare the response to MMF with that of other immunosuppressive regimens. The study was approved by the Institutional Review Board of Columbia University Medical Center. We reviewed the charts of all patients with C3 glomerulopathy from 1997 to 2015. C3 glomerulopathy was formally recognized as a pathologic entity in 2010; therefore, patients who had a kidney biopsy before 2010 but were later recognized to fit the clinical and histologic profile for C3 glomerulopathy had their biopsies reviewed by a pathologist to confirm the diagnosis. All biopsies were processed by standard techniques for light microscopy, immunofluorescence microscopy, and when possible, electron microscopy. The diagnosis of C3 glomerulopathy was made on the basis of the 2013 C3 GN consensus guidelines and required C3 staining on immunofluorescence that was at least two orders of magnitude greater than any Ig staining (14). Three patients from the Istanbul cohort were included in a recent analysis of C3 glomerulopathy (24). Of the 120 patients with C3 glomerulopathy in the database of the Center for Glomerular Diseases at Columbia University Medical Center and Istanbul University, we identified 33 patients who had been prescribed MMF for treatment of C3 glomerulopathy. The decision to treat with immunosuppression was at the treating nephrologist’s discretion. In general, immunosuppression was used for patients with evidence of nephrotic-range proteinuria, AKI, and/or moderate to severe disease activity on a recent biopsy. MMF was dosed at 1000 mg twice daily for at least 3 months. Treating nephrologists could (1) use concomitant corticosteroids and (2) continue MMF at their discretion. Of the 33 patients, 30 patients completed a course of MMF with at least 1 year of follow-up time from the initiation of MMF. The histories, clinical features, genetic profiles, and laboratory data of these 30 patients were recorded and analyzed. We identified 43 patients who received a full course of another nonspecific immunosuppressive agent in combination with steroids and compared the rates of remission across different regimens. Whole-exome sequencing was performed by using the Agilent SureSelectXT Human All Exon V4 capture kit followed by next generation sequencing technology (Illumina Sequencing Technology). Sequence alignment and variant calls were conducted as previously described (25). We focused on analysis of the 36 genes of the complement system gene family approved by the Hugo Gene Nomenclature Committee (http://www.genenames.org/cgi-bin/genefamilies/set/492). We selected rare coding variants (minor allele frequency <0.001 in the Genome Aggregation Database [GnomAD] version 2.0) that were predicted to be damaging on the basis of Polyphen and CADD scores (http://gnomad.broadinstitute.org/). We also searched for ClinVar annotations. The pathogenicity of the variants was annotated on the basis of the American College of Medical Genetics and Genomics (ACMG) guidelines (26). The variants predicted to be damaging were all confirmed by Sanger sequencing. The primary outcome was remission of disease defined as either complete remission (stable or improved eGFR with decline in proteinuria to <0.5 g/g creatinine [Cr] by urine protein-to-Cr ratio) or partial remission (stable or improved eGFR with ≥50% decline in proteinuria to between 0.5 and 3.5 g/g Cr by urine protein-to-Cr ratio) at last follow-up. Stable eGFR was defined as within 15% of baseline. Patients were categorized as “responders” if they had either complete or partial remission concordant with MMF treatment. Patients were categorized as “nonresponders” if they did not achieve remission on MMF. Secondary outcomes were progression to ESKD (defined as initiation of dialysis or transplantation) and relapse (defined as return to pre-MMF level of proteinuria or declining kidney function after any remission). Covariates compared between responders and nonresponders were clinical presentation (urinary abnormalities alone, CKD with urinary abnormalities, nephrotic syndrome, or rapidly progressive kidney failure), serum Cr at time of diagnosis, proteinuria at time of diagnosis, presence of rare genetic variant in the complement pathway or autoantibodies affecting complement regulation, serum complement levels (C3, C4, and soluble C5b-9), and histologic findings, including injury pattern on light microscopy, immunostaining (C3 alone versus C3 dominant), and location of deposits on electron microscopy. eGFR was calculated using the Modification of Diet in Renal Disease Study equation (27). Urine protein measurements are reported as random urine protein-to-Cr ratios. Continuous variables were compared by t test for normally distributed data or Mann–Whitney U test for nonparametric data. Categorical variables were compared by Fisher exact test. We identified 120 patients who had biopsy-proven C3 glomerulopathy and were followed at the Center for Glomerular Diseases of Columbia University or Istanbul University from 1997 to 2015. Of 33 patients prescribed MMF, 30 received MMF therapy for at least 3 months. Three patients did not complete 3 months of therapy because of diarrhea, angioedema, and leukopenia. One patient had dense deposit disease, and 29 had C3 GN. Of 30 patients receiving MMF, 20 had partial or complete remission and were classified as responders. There were no significant differences in baseline characteristics between responders and nonresponders (Table 1). The cohort consisted primarily of young adults with median age of 25 years old (interquartile range [IQR], 18–36). Twenty-five of the 30 (83%) patients were white, and three of 30 were black. Kidney function was only mildly reduced at the time of diagnosis (Figure 1A), with median Cr of 1.07 mg/dl and eGFR=62 ml/min per 1.73 m2. Abnormal urinary findings alone (hematuria and/or proteinuria with preserved eGFR) were the most common presentation (shown in one half of the patients) followed by nephrotic syndrome (nine patients or 30%). Proteinuria at time of diagnosis was lower (median 2468 mg/g Cr) in responders compared with nonresponders (median 5000 mg/g Cr), although this did not reach statistical significance (Figure 1B). Six patients had a febrile illness within 6 months of biopsy: two with upper respiratory tract infection, one with documented adenovirus infection, one with pyelonephritis, one with unspecified diarrheal illness, and one with documented Clostridium difficile infection. Median follow-up time was 32 months (IQR, 21–68). Changes in creatinine and proteinuria in patients with C3 glomerulopathy according to response to mycophenolate mofetil therapy. At initiation of a standardized regimen of mycophenolate mofetil, responders (n=20) and nonresponders (n=10) had similar baseline kidney function. 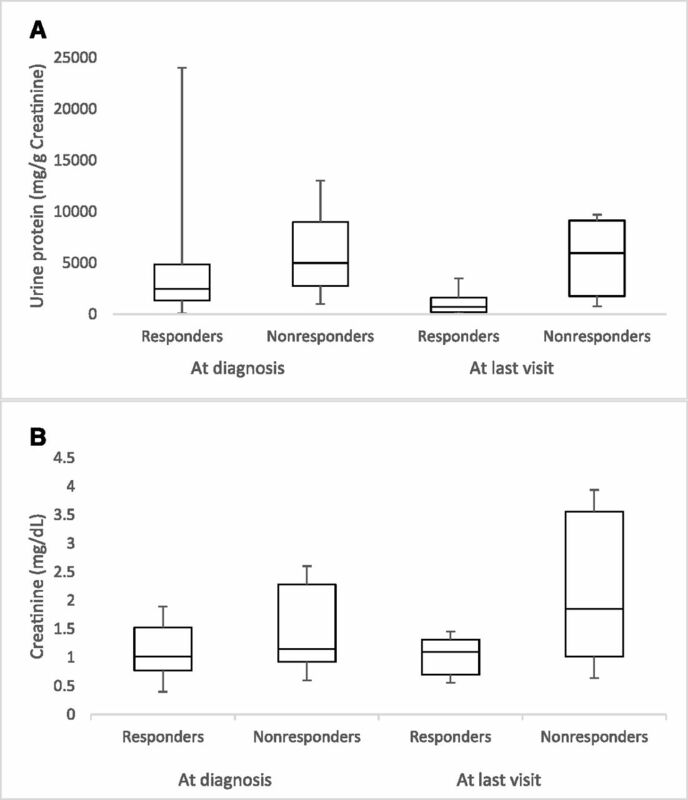 (A) Proteinuria at diagnosis is lower in responders than nonresponders. (B) Creatinine at diagnosis is similar in responders and nonresponders. The most common histologic pattern on light microscopy was membranoproliferative GN, which was seen in approximately 80% of the patients; the second most common pattern was mesangioproliferative GN in 13% of patients (Table 2). On immunofluorescence, most patients had low-level concomitant Ig staining with dominant C3 staining at least two orders of magnitude greater than any component (67%), whereas the remainder had only C3 staining (33%). On electron microscopy, electron dense deposits were most commonly located in the mesangial region and least commonly seen in the subepithelial space. In concordance with the preserved kidney function detailed above, only three (11%) patients had more than moderate interstitial fibrosis at time of biopsy. Responders had less fibrosis than nonresponders. Whole-exome sequencing was completed in 22 of the 30 patients. In 12 patients, we found 18 variants predicted to be damaging (Tables 3–5). Twelve of these variants were in responders, and six were in nonresponders. None of these variants was previously reported to be pathogenic in the ClinVar Database. Of note, one patient was found to have a homozygous single-nucleotide deletion (c.130delT:p.Y44Mfs*42) involving isoform 1 of the C5 gene, which is predicted to result in premature termination signal. The patient is an offspring of consanguineous union and developed ESKD necessitating transplantation. This variant is predicted to affect six of seven C5 transcript isoforms listed in the National Center for Biotechnology Information, but one predicted isoform (XM 017015103.1) with an alternate translation initiation start site in the 5′ untranslated region would remain unaffected. Complement C3 was low at the time of diagnosis, and C3 and C4 levels were normal in the proband and her father at last follow-up. There is no history of recurrent bacterial infections or dermatitis, which are characteristic of C5 deficiency, suggesting that the genetic variant does not result in a loss of function. Additional studies including complement pathway activity level will be needed to assess functional consequences of this variant. C3 nephritic factor and factor H autoantibody were assayed in 14 patients: two (14%) had C3 nephritic factor, and one (7%) had factor H autoantibodies. There was no difference in patients with low serum complement levels at onset of therapy between responders and nonresponders (70% of both groups had low C3 levels). Of the 13 patients in whom soluble membrane attack complex (sMAC) C5–C9 levels were measured, nine (69%) had elevated sMAC levels, of which eight achieved remission with MMF; in contrast, two of the four without elevated levels responded to MMF. All patients received MMF 1000 mg twice daily for at least 3 months. Median time on therapy was 24 months (IQR, 13–34). Of the 30 patients treated with MMF, 28 (93%) also received corticosteroids, and 25 (83%) were on stable doses of angiotensin converting enzyme inhibitor or angiotensin receptor blocker therapy. Patients in the Turkish cohort (n=8) received 6 months of oral prednisone before beginning an MMF-based regimen with concomitant oral prednisone. Patients in the Columbia University cohort (n=22) initiated MMF concurrently with oral prednisone. Of the 30 patients treated with MMF, 20 (67%) met our criteria as responders, with ten complete remissions and ten partial remissions. Median time from start of MMF to remission was 291 days. At last follow-up, eight of 20 patients in the responder group and five of nine patients in the nonresponder group had been tapered off MMF. Of the patients in the responder group who had been tapered off MMF, four patients had a relapse; time to relapse was between 6 months and 2 years after medication discontinuation. At last follow-up, median proteinuria was 729 mg/g Cr (215–1619) and serum Cr was 1.11 mg/dl (0.70–1.31) in the responder group, whereas proteinuria was 5950 mg/g Cr (1766–9125) and serum Cr was 1.85 mg/dl (1.02–3.56) in the nonresponder group. Three of the nonresponders and none of the responders progressed to ESKD. There were minimal side effects of the regimen, including transient nausea and abdominal discomfort, but there were no significant infections requiring hospitalizations, leukopenia, or Cushingoid features. There were no deaths in either group. 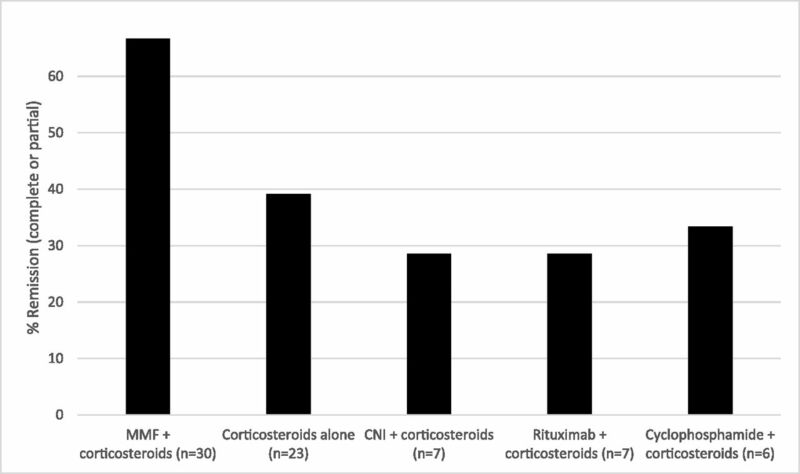 Of the remaining 87 patients in the C3 glomerulopathy registry, follow-up data were available in 43 patients who received a minimum of 3 months of steroids with or without an alternate immunosuppressive agent. The remission rate with MMF in combination with steroids (67%) was higher than that with steroids alone (39%) and steroids in combination with cyclophosphamide (33%), calcineurin inhibitor (29%), and rituximab (29%) (Figure 2). Mycophenolate combined with steroids outperforms other common immunosuppressive regimens. Response to nonselective immunosuppression in C3 glomerulopathy. Mycophenolate mofetil (MMF) in combination with steroids outperforms therapy with other commonly used immunosuppressive agents with respect to complete or partial remission. Data on patients treated with other forms of immunosuppression are adapted from a Columbia University Medical Center–based observational cohort published elsewhere (33). CNI, calcineurin inhibitor. This is the largest series to date and the first predominantly United States series of patients with C3 glomerulopathy treated with a regimen of MMF and prednisone. Here, we show that 67% of patients treated with MMF had complete or partial remission. Three (10%) patients, all nonresponders, progressed to ESKD. There were no deaths in either group. In our analysis, no clinical, histologic, or genetic variable was associated with response to therapy, although baseline proteinuria was numerically but not statistically significantly greater in nonresponders (5 versus 2.5 g/g Cr). There was a suggestion in the small subgroup with sMAC testing that an elevated sMAC level was associated with response to therapy. Importantly, over long-term follow-up, 50% of patients taken off immunosuppression relapsed. Before our study, the largest study examining the use of MMF for treatment of C3 GN was by the GLOSEN group (18). They conducted a retrospective review of 60 patients with C3 GN. Of these, 20 patients did not receive immunosuppression, 22 patients received corticosteroids plus MMF, and 18 received corticosteroids either alone or with cyclophosphamide. Rituximab was not used. Patients who did not receive any immunosuppression were more likely to develop ESKD than patients who received any immunosuppression. Furthermore, no patient treated with MMF in the GLOSEN cohort doubled their serum Cr or developed ESKD. Clinical remission was achieved in 86% of the patients treated with MMF, of which 32% were complete remissions and 68% were partial remissions. Relapse in proteinuria occurred in six of 16 patients after reduction of MMF dose, and thus, the dose was re-escalated. They reported that 20 of 22 patients were still receiving MMF at the last available follow-up. Although nonrandomized and retrospective, the study supported the finding that MMF, an immunomodulatory drug, might be beneficial in C3 GN. Our study differs from the work by the GLOSEN in that we examined a more diverse population treated with a set course of MMF and analyzed variables associated with response to therapy. Compared with the GLOSEN, our patient population was younger (median age 25 versus 35 years old), included black patients, and had lower proteinuria (median 3200 mg/g Cr in our cohort versus 6500 mg/24 h in their MMF-treated group). The most common clinical presentation in our group was asymptomatic urinary abnormality versus nephrotic syndrome in the GLOSEN group. Compared with the GLOSEN cohort, our patients experienced lower response rate with regard to clinical remission (66% in our cohort versus 86% in the GLOSEN) and ESKD (10% in our cohort versus 0% in the GLOSEN). These features suggest that our patients compared with those the GLOSEN cohort may have had less active or smoldering forms of C3 glomerulopathy that were, therefore, less amenable to high-dose immunosuppression over a relatively short period of time (months) in the context of the disease course. Moreover, compared with the patients in the GLOSEN cohort, very few of our patients had C3 nephritic factor or rare gene variants in the alternative complement pathway. Soluble membrane attack complex levels (C5b–9) were not reported by the GLOSEN group. Ten percent of our patients had severe interstitial fibrosis and tubular atrophy, whereas no patients in the GLOSEN MMF group had >50% interstitial fibrosis and tubular atrophy, again consistent with our patients manifesting a more chronic form of disease. Both groups of patients received a similar initial dose of corticosteroids (1 mg/kg tapered over 6 months) along with MMF; however, patients in the GLOSEN group were more likely to receive maintenance corticosteroids, which may also explain their higher response rates. Eculizumab, an antibody against C5 that prevents assembly of the soluble membrane attack complex, has been used for treatment of C3 glomerulopathy in the native kidney and the allograft with varying results (20,21,28). Compared with intravenous eculizumab, oral MMF is more affordable, and it is certainly easier to administer over prolonged periods of time. MMF plus corticosteroids may be a good treatment option for some patients with C3 glomerulopathy given the results of our study and the GLOSEN results. Mechanistically, MMF may work by decreasing antibody production and therefore, may be more efficacious in patients with autoantibodies, such as the C3 nephritic factor. However, given that few of our patients who responded had detectable autoantibodies, MMF may also work through its antiproliferative and anti-inflammatory properties thought to be important in lupus nephritis (29) and maintenance of solid organ transplants. One unexplained issue is why recurrences of the disease occur after transplantation in patients who are usually already on full doses of MMF. Whether relapses will occur in our population with longer follow-up on MMF remains to be clarified. It is plausible that MMF, like corticosteroids, slows but does not halt disease progression. Patients with more active disease are likely more treatment responsive than those without active disease. Disease activity in C3 glomerulopathy may be assessed by checking the functional activity of the alternative complement pathway, following C3 levels, and following the soluble membrane attack complex levels. sMAC levels have been found to correlate with response to therapy in some reports of C3 glomerulopathy as well as atypical hemolytic uremic syndrome, another disease of the alternative complement pathway (20,30,31). In our study, there is a suggestion that those who respond to treatment with MMF have elevated sMAC levels, but this did not reach statistical significance. Although in this study, sMAC levels were inconsistently followed during the treatment course, this may be an informative marker that should be further investigated. Our study has several limitations. The size of our study, typical for a very rare disease, is small, and thus, this limits power for statistical comparisons. Those who received MMF likely had a more severe presentation or proteinuria than those who received no treatment, and they may have had a less severe presentation than those who received other immunosuppression, such as cyclophosphamide. We are unable to separate the effects of corticosteroids from those of mycophenolate. Finally, given the chronic nature of C3 glomerulopathies, despite our follow-up period extending, on average, over 2.5 years, we rely more on surrogate end points (remission) than hard outcomes (ESKD, which was achieved in only three patients). The strengths of this study include the number of treated subjects (the largest series to date of patients with C3 glomerulopathy treated with MMF) and the standardized dose of MMF for all patients. Additionally, we performed whole-exome sequencing in 22 of 30 patients rather than candidate gene testing. In 12 of the sequences in these patients, we found at least one rare coding variant in the complement system genes that is predicted to be damaging. We did not find any pathogenic variant according to the ACMG criteria. With the availability of large public genomic databases, such as GnomAD or Exome Aggregation Consortium, many variants previously reported as pathogenic may be reclassified as benign, because they have a higher frequency than the expected disease prevalence. The lower rate of pathogenic variants in this study compared with prior reports (32) is likely attributable to using rigorous allele frequency filters and criteria for variant pathogenicity recommended by the ACMG. Thus, our study may have a lower false positive rate than that in other studies. In summary, our findings suggest that MMF plus corticosteroids induced remission in 67% of a diverse population of patients with C3 glomerulopathy. We noticed trends of higher sMAC levels in MMF responders and heavier proteinuria at the start of therapy in MMF nonresponders. Future studies will be necessary to confirm and extend the role of immunosuppression in treating C3 glomerulopathy. A.S.B. has received consulting honoraria from and/or served on advisory boards for Chemocentryx, Achillion, and Omeros. G.B.A. is a consultant for Alexion, Omeros, Achilion, Genentech, Merck, EMD Serono, and RA Pharmaceuticals. He lectures for Genentech and Sanofi-Genzyme. He conducts research studies with Regulus and BM Squibb. These data were originally presented in abstract form at the November 3–8, 2015 American Society of Nephrology Kidney Week in San Diego, CA.